I always enjoy reading about other projects and the wealth of knowledge on all things Capri on here and thought it was about time I contributed something myself. Here is my Capri looong term project. I picked it up last year and made a start on it in last February. As with most projects I expect it to be hanging around for a while. The car was originally a 1600 automatic however that has long gone and came with a V6 Essex in pieces and Celica 5 speed conversion. Due to the car not being in original condition and quite rough I will be doing some modifications along the way. I have sold on the V6 and 5 speed conversion as I would like to use something more modern. The first area I have started with was removing the front guards, Valance and radiator support. to repair the damage it has sustained in an accident prior to the existing damage! As the guards have been removed years ago to do a botch repair, they came off quite easily this time around. The left guard having being replaced with a brand new one some time ago it was in great condition with no rust. 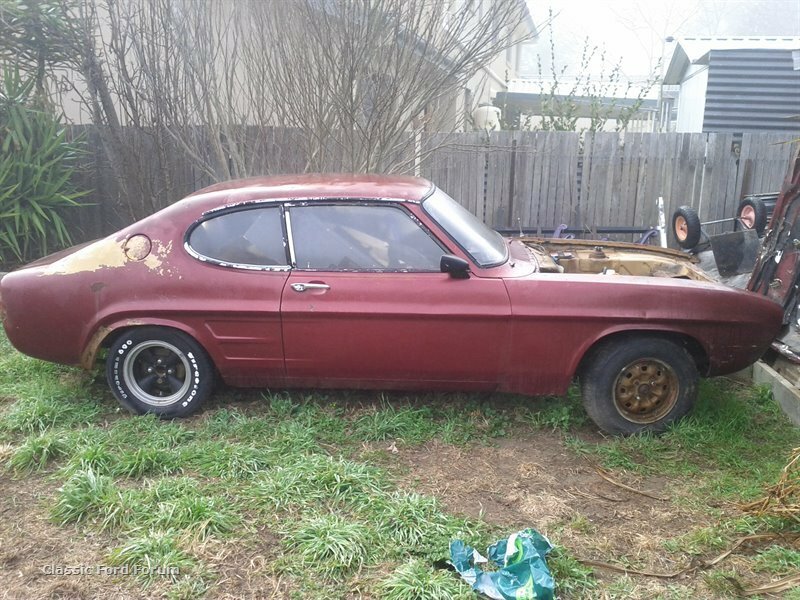 It is good to see another Capri being resurrected, and another rebuild thread to follow. What did you have in mind in terms of engine? This car looks familiar, did it come from Canberra? Deano, the jury is still out on what engine to use. I did pick up a Getrag 221 gearbox with clutch and flywheel locally that bolts to the 3l V6 Duratec however not sure if all the work required to do the conversion is worth the power gain, although how fast does a car need to go? I have plenty of body work to do while a decision on engine is made. Jamie you are correct, well spotted. The guards are off (that was the easy part) now the work begins, the usual rust in the "A" pillars and damage to the right inner guard and front cross member is just the start. Looks like you have plenty to keep you busy. Good luck. man that drivers inner guard has taken a beating - u might have to graft in a new front section? I thought the same spud15. I managed to get a front cut which had a reasonable radiator support (although the later version) good headlight surrounds, inner guards and front valance with a large hole hacked out of it. I have managed to track down another Capri that was being wrecked that had a good RH inner guard section. I have a spare good LH inner guard if anyone needs it. What a good repair! Another one brought back from the brink. $740 is a good buy in any case. It looks in better condition than mine, how do you find the time to repair all the cars you have? - its great to see another one salvaged from certain oblivion. Made up a new front cross member as the old ones I had weren't any good, bent and cracked. Everything seems to fit up OK. The Valance needs a piece made to fill the huge hole put in it by a previous owner. I was thinking of putting the two large air slots in it like the early RS2600 has. Doe's anyone know the hole width on the RS2600 front valance? looking at pictures of them it seems the outside edge is the same as the bumper bracket slot. Got the one I brought home - a 69 gt but a parts car - like the inner guard repair - very neat!